P3s are not magic. They are not free money. But they can accelerate projects. Here’s how. Compared to many regions around the country, Los Angeles County is in a unique position when it comes to our future transportation system. Many places struggle to find funds for robust transportation investments. Others endlessly debate what should be built and where. Los Angeles doesn’t have these problems. Thanks to the voters’ approval of Measure M, Metro has a long-term plan for transit and highway projects and the resources to build it. What our county does have are notorious transportation and traffic challenges that demand a sense of urgency. We are strangled by traffic and underserved by mass transit. But funds from Measure M accumulate over several decades, so the agency can’t build everything at once. No one wants to hear that everything will be awesome transportation-wise — if we can just wait 40 more years. Los Angeles County’s unique position allows for a different perspective on the use of Public Private Partnerships (P3s). While many agencies around the United States rely on P3s as a financing tool to build projects that wouldn’t get built otherwise, we look at P3s as an opportunity to accelerate projects already in the pipeline, such as the Sepulveda Transit Corridor. 1) P3s Enable Innovation. A fresh pair of eyes with the right incentive structure is critical to innovation. Especially when we only specify what we want to build, but not how to build it. This is what the private sector brings to the table – better ways to achieve Metro’s project goals. 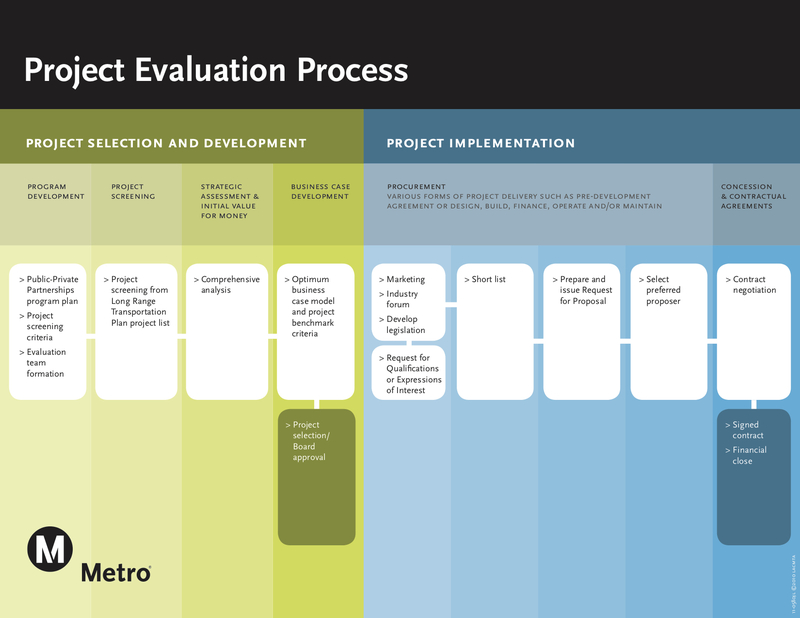 This chart shows how Metro analyzes proposals from the private sector for public-private partnerships. Under a P3, the project contractor has both the financial incentive and flexibility to choose the most cost-effective route to achieve Metro’s desired outcomes, both for design and construction and possibly the operation and long-term maintenance of a project. This creates an opportunity for innovation and new approaches that can lead to lower costs, better performance and a faster project delivery. 2) P3s Bundle a Project’s Full Cost and Spread it Over Time. When a public agency builds a project, it often hires one contractor to design it and another contractor to construct it. When complete, the agency then operates it. Each of these contractors is primarily concerned with controlling costs and outcomes for its portion of the project. This may lead to decisions that may save money in the short run but increases costs or reduces performance in the long run. We tend to focus on construction costs, but a project’s long-term operational and maintenance costs are far greater and can offer more opportunities for efficiencies and savings. Separate contracts also fragment responsibility for design flaws, construction delays and deficiencies and operational shortcomings. 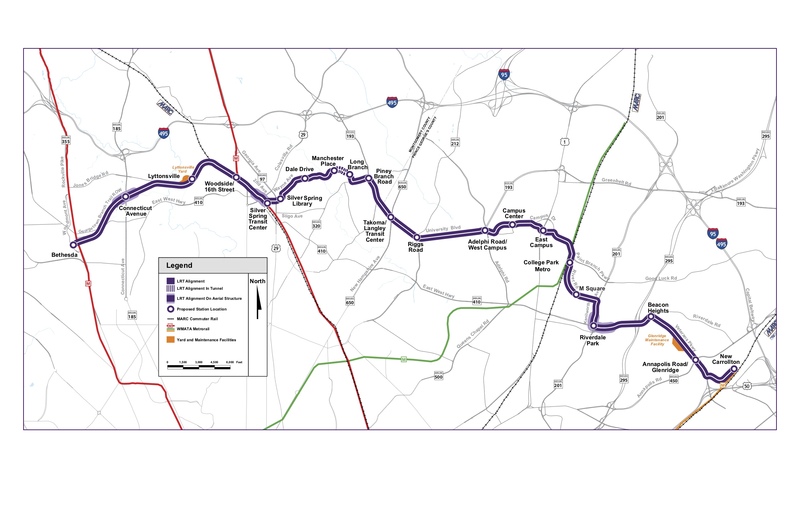 A 16-mile light rail line in Maryland called the Purple Line is being built with a public-private partnership. More info at: http://www.purplelinemd.com/en/home. When a contractor is responsible for all of a project’s costs and outcomes, they design and construct the project more holistically to reduce total project cost and improve performance over the full term of the contract. Any long-term savings can be used to enable faster project delivery. The bundling of a project’s full cost in a P3 can allow Metro to spread that cost more evenly over the lifetime of the asset. Rather than paying for the full cost of project construction up front, P3s finance project costs over 20 to 35 years — sort of like a home mortgage. This frees up funds making it possible to accelerate a project. 3) P3s Better Allocate the Cost of Risk. All major projects have risks, and all risks have a cost. Utilities aren’t where they are supposed to be. Concrete doesn’t set right. Electrical systems fail. More complicated and expensive projects – like most of Metro’s planned investments – have the most costly risks. When a public agency uses a traditional design-bid-build or design-build process, it assumes most of the associated project risks. In other words, any costs related to delays on the project will be borne almost entirely by the public sector. With a P3, there is risk sharing. As part of its financial contribution to the project, the private sector accepts many of the risks of the project; including cost overruns and delays, as well as poor operational performance. The private sector is willing to take on risk because it can make money if the risk is well managed. 4) Discipline by the Agency and by the Contractor: Considerable upfront planning and due diligence goes into a P3 project. This results in Metro developing a much deeper understanding of the project’s requirements and risks, and better articulating these to potential contractors. This increases the chance the project can be built more quickly. The private partner has strong incentives to complete the project within defined timelines because they don’t get paid (and therefore can’t repay their lenders) until the project is delivered and approved by the public agency. Even with these advantages, Metro’s projects are complex and challenging to build, and there’s no getting around time-intensive requirements like environmental reviews and public permits. But P3s have the potential to give Metro far more flexibility to delivering new transportation options to L.A. County residents as soon as possible. That’s why we’re heading in this direction for some of the most challenging mid-Measure M projects, such as the Sepulveda Transit Corridor Project and the West Santa Ana Branch. This post was written by Joshua Schank and Colin Peppard of the Office of Extraordinary Innovation. Theories by consultants are fine to read, but it is my opinion that the current buzz-word: “Public Private Partnership”, is fret with possible conflicts of interest that can result in the Public paying the “rent” and the Private firm going to the bank. The Book says: “No person can serve two masters…” Matt: 6:24. This verse comes to mind when I try to understand Metro/Morlin’s PPP at Metro’s Union Station. This all looks to be talk and hot air. When is a substantial PPP going to move forward? Metro is looking for a PPP for the West Santa Ana Branch Line and the Sepulveda Line.